Every active family needs an emergency first aid kit. Unfortunately, I seem to need to be reminded of over this and over again. Sometimes we have the right stuff to deal with the scrapes and bumps that come with sports, playgrounds, rough housing and ill-advised balancing acts. Often we don’t. Whether we have forgotten to replace items we’ve used or simply neglected to bring the kit on our outing too often, we are scrambling to deal with a bump or a scrape. Recently, my family was about to hit the road at the tail end of a family vacation. As we were loading up the car ahead of a very long drive, I wasn’t thinking much about scrapes or our first aid. All of a sudden we were contending with ankle to thigh scrapes my son received while trying to use the curb in the parking lot as a balance beam. As we frantically dug for our virtually empty first aid kit a nice lady offered us bandages in her glove compartment. I managed to find an instant cold pack to help ease the pain. We still had to find a way to wash the scrape! Eventually, we suffered through long looks from other guests as we made our way to the hotel lobby bathroom with our wailing child. During the 10-hour drive that followed I resolved to make sure that I had a handy and complete emergency first aid kit on hand. I also resolved to refill it each spring and fall. Then I started mentally composing the kit. When you are on the go moving from activity to activity with your kids, you always try to be prepared from snacks, drinks, an extra fleece, and sunscreen. That list should probably include bandages and wound cleansers too. When I started pulling together our kit, I realized that just like in the hotel parking lot, one of the biggest hurdles I face with accidents that happen on the go are ways to clean the wound. Whether it is on a trail, sports field or parking lot a bathroom with running water never seems to be handy. 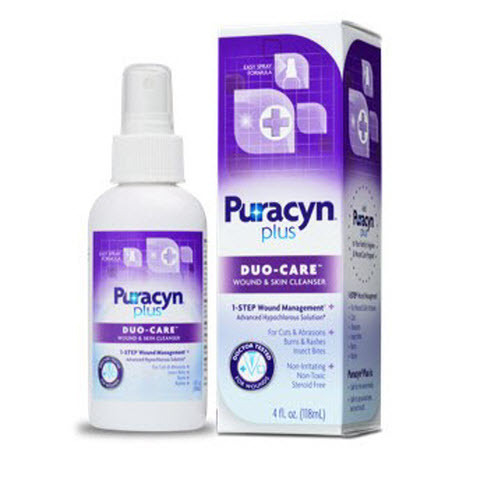 As I searched around I discovered Puracyn® Plus Duo-Care™ Wound and Skin Cleanser a new product that is a great solution to that very problem. Providing an advanced alternative to saline solution, Puracyn® Plus is a safe, effective, and easily applied FIRST step in first aid for minor, painful cuts and abrasions, burns and rashes, and insect bites. Puracyn® Plus is also easy to use. It comes in a hands-free spray application that thoroughly cleans minor wounds eliminating the need for the running water in the critical first step of cleaning a wound. Almost just as important Puracyn® Plus is doctor tested and is non-stinging, and non-irritating and free of antibiotics, steroids, and alcohol. It is completely safe for use virtually anywhere on the body. My son’s first question with medicine is always “Is it going to hurt? Wonderful to know I can answer him honestly. Frankly, after tearing up in pain last year when applying other treatments to my own road rash, I’m personally looking forward to that feature too! My kit so far includes bandages, cold packs, tweezers, bug spray, sunscreen, Puracyn® Plus Duo-Care™ Wound and Skin Cleanser. I will also be including Puracyn® Plus Foot Wash & Skin Cleanser in my kit. Warm weather for me seems to signal blister season for me. Similar to its sister product, Puracyn® Plus Foot Wash & Skin Cleanser’s advanced hypochlorous solution is non-irritating, non-toxic, steroid free, and won’t stick to bandages. –Eliminating the maddening situation of bandaging a blister only to make it worse! Fortunately, Puracyn® Plus is easy to find and is available in a 4oz. plastic, spray bottle at Rite Aid and Walgreens for $14.99. Also, now through March 27th, enter the Play to Win with #TeamPuracynPlus Giveaway on the Puracyn® Plus Facebook page (www.facebook.com/puracyn) for the chance to be one of three randomly selected winners to receive a Puracyn® Plus Sports Emergency Kit, including a $50 gift card to a sporting goods store of your choice and Puracyn® Plus product. What are the critical components in your on the go first aid kit?